Bay View guests have many attractions, restaurants and things to do right at their fingertips, especially being right off the Myrtle Beach Boardwalk. As you sit on your balcony and relax with the ocean breeze, you are planning your activities for the week. If you want to head out for a fun night, there are so many options for you to choose and there are many amazing live-entertainment choices, but how about trying out a new guy in town – The Asher Theatre. Now, visitors to the area can add a new option to the already-lengthy list of live-entertainment destinations — the Asher Theatre, found just off Highway 501 in Myrtle Beach, opened its doors in 2018. Here, the stage plays host to regular performances and competitions that are sure to send audience members home with smiles on their faces and, often, tapping their toes. Hot Jersey Nights (Jan. 3-April 27, 2019): Back in Myrtle Beach by popular demand, this production celebrates the music of Frankie Valli and the Four Seasons. Starting with the group’s earliest days in a backstreet New Jersey studio and continuing through the success of some of its greatest hits like Sherry, Rag Doll, Big Girls Don't Cry and Walk Like a Man, the hit show is sure to take attendees on a nostalgic musical journey. 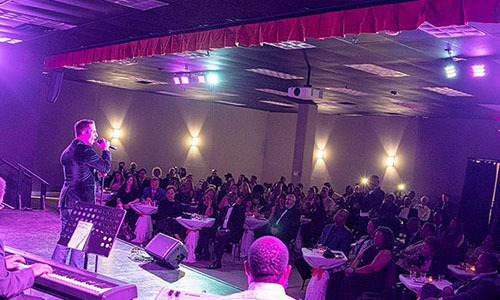 The Detroit City Boyz — A Motown Tribute Show (Feb. 1-2, 2019): Celebrating the hits of The Temptations, The Four Tops, Stevie Wonder, Boyz II Men and more, this show features a talented musical foursome who bring some of the top tunes of the ’60s through the ’90s to life. Attendees will be treated to Motown at its best and will hear some of the tunes that changed America. To see the Asher Theatre’s full schedule of events, visit ashertheatre.com. And, after catching a show (or even taking the stage) at the Asher Theatre. After a fun evening either singing the old Motown songs, or dancing to the Frankie Valli and Four Seasons, or maybe even giving it a go to win the Karaoke title, you can head back to your room at Bay View Resort, and continue the smiles as you enjoy the views from your balcony in the heart of Myrtle Beach.